This entry was posted in Photos and tagged fossil, fossil collecting, fossil finding, fossil hunt, Fossil Hunting, fossils, shark, tooth. UKAFH interviews Dr. Adam Smith, curator of Dinosaurs of China. Dr. Adam Smith is curator of Dinosaurs of China and of the Nottingham Natural History Museum at Wollaton Hall, which hosts the Dinosaurs of China exhibition alongside its extensive collection of over 750,000 exhibits and 40,000 fossils. Anyone interested in palaeontology and modern understanding of dinosaur and bird evolution and really needs to get to the groundbreaking Dinosaurs of China exhibition. The specimens on display are incredibly important, many seen for the first time outside of China. The curation is superb, blending the extraordinary fossils with Wollaton Hall’s permanent natural history collection and enlivened by fresh new palaeoart which imagines the creatures in life based on our most up-to-date research and scientific knowledge. With a lifelong interest in fossils, Adam established his own fossil collection as a child before embarking on undergraduate and postgraduate degrees in Palaeobiology. Outside of the day job Adam is a keen palaeoartist, a subject which is highly integral to the Dinosaurs of China exhibition. He also advises toy company Safari Ltd. on their dinosaur figures as well as running the Dinosaur Toy Blog and Forum and the Animal Toy Forum. His personal research focus is Plesiosaur and he was consultant to the BBC on Planet Dinosaur. We invited Adam to tell us more about his love of fossils and asked for his pearls of wisdom for budding palaeontologists, young and old. 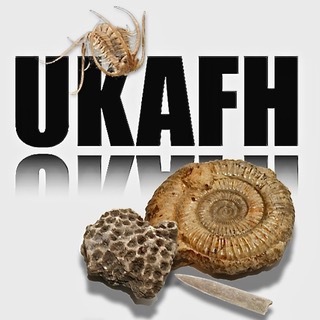 UKAFH: What attracted you to fossil collecting? AS: I suppose I was attracted to fossil hunting because fossils connect us to prehistoric worlds. Fossils are real and tactile so it made sense to collect some for myself. There’s also that hope that one day you might discover a new species of dinosaur, but I never found anything of importance! Even if I had, I would’ve donated any significant discoveries to my local museum. UKAFH: Which finds were your favourites and why? AS: Ammonites were always my favourite discoveries because they are so iconic and beautiful. The shiny pyritic ones at Lyme Regis are extremely common but always a joy to discover. UKAFH: How did fossil hunting inspire you? AS: There’s something special about being the first person to see the remains of a creature that died millions of years ago. Fossil hunting also gets you out in the field and helps you to understand the objects in their geological context. Chris Packham and Dr. Adam Smith welcome visitors with Mamenchisaurus towering above. UKAFH: What advice would you give to amateur fossil hunters whose passion inspires them to progress into palaeontology? AS: Collecting fossils is sometimes an end to itself for many amateurs. However, I would advise amateur fossil hunters with a serious interest in palaeontology to take up a hammer in one hand and a scientific paper in the other and learn as much as they can about the fossils they discover. Amateurs can attend academic conferences, such as the annual SVPCA and PalAss meetings, which are open to all and provide an opportunity to learn about current palaeontology directly from those conducting the work. This can also open doors. UKAFH: Is it ever too late to attempt a career in palaeontology? AS: So long as the passion is there, it is never too late to attempt a career in palaeontology. However, you have to be realistic – it can take years of hard work to get to the stage where you can make new contributions to the field, and even then paid jobs are few and far between. For example, conducting research isn’t part of my job remit as a curator at Wollaton Hall; I research and write papers about plesiosaurs in my personal time out of passion. UKAFH: What routes and opportunities are there for amateurs? AS: Every professional palaeontologist began as an amateur. The traditional route is through university and that’s the one I took. However, I know several self-taught palaeontologists who have made significant research contributions. Especially now in the information age it is possible to gain knowledge by seeking out academic papers online and attending academic conferences. Most palaeontologists are more than happy to send PDFs of their papers to anyone who asks – they’re just an email away. Volunteering can also help get good working knowledge and hands on experience working in a museum. Featuring fossils and specimens never before seen outside of Asia, Dinosaurs of China will bring to life the story of how dinosaurs evolved into the birds that live alongside us today. Wollaton Hall, Nottingham, will host the main exhibition, with a complementary exhibition at Lakeside Arts, running from 1 July – 29 October 2017. Adults: £7 Child: £5 Family Ticket: £20 All tickets subject to additional 10% booking fee. Under 5’s visit for free. Carers free. Look out too for the museum’s forthcoming new permanent Jurassic exhibition which will showcase fossils from the museum’s 40,000 strong collection, including locally found specimens like a dinosaur footprint from Mapperley, a Liopleurodon tooth complete with palaeoart model to show the creature it came from and the very important Nottingham ichthyosaur which can be seen at Lakeside Arts as part of the Dinosaurs of China exhibition and has been researched by UKAFH patron Dean Lomax. This entry was posted in Reports and tagged china, Chinasaurs, Chris Packham, dinosaur, Dinosaurs of China, fossil, fossil finding, Fossil Hunting, fossils, Nottingham.